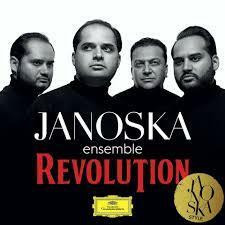 The internationally renowned Janoska Ensemble will be performing tonight in Olean at the The Regina A. Quick Center for the Arts. What makes the group stand out is their improvisational arrangements of classical pieces and on their new album, Revolution, they mix Bach with the Beatles. WBFO’s Nick Lippa spoke with the group’s double bass player Julius Darvas. Nick Lippa: This group is from Vienna, Austria and has been playing together since childhood as brothers. Give me a little background about how everything came together. NL: It’s not often you see improvisation in the classical realm, but it used to be more common right? JD : You know, in classical music in the baroque and to times with Mozart, the improvisation was totally normal. Everybody was improvising. Everybody was playing free cadenzas and so on. And this art of improvisation, it went lost in classical music today. Because in high school it’s not taught anymore. And we have such good scores, that everything is so good written, that nobody cares about improvisation. NL: So let’s talk about your album Revolution. You play three arangements of Beatles songs on here. Why the Beatles? JD: We flew over Asia and there was a documentary film about the Beatles. Everybody saw this film and of course we all know the Beatles and we love the Beatles because their music is so touching and it’s a very easy form of music but a fantastic genius form of music. So we decided to have a tribute to the Beatles. NL: And I heard you got what you wanted in one take when you recorded. JD: The Beatles, they were very spontaneous composing pieces in the studio that they were recording. Our new CD, Revolution, we also have three pieces on it that was born in the studio. So we create the music there in the studios and we make three or four takes of it, but mostly the first take, that was it. NL: You do a version of Yesterday that you blend with a Bach Cello Suite. Is there a connection between the baroque period of music and the Beatles? JD: When ‘Yesterday’ came out when the Beatles wrote it, it was genre’d into a pop/baroque genre. And that was very important to us to give back the feeling of baroque to the Yesterday piece. So we combine it with (a) Bach Cello Suite. NL: If Bach were alive today, what do you think he would be composing? JD: So Bach is one of our very favorite composers. I would think that Bach also would have gone with the time. And he would maybe build up some new elements also. Maybe rhythms in his music. Very interested in the Latin American rhythm with syncopations, and polyrhythms, 7/8 polyrhythm bars or something like that. NL: Hello Prince! is one of the the original pieces you recorded for this album and happens to be in 7/8. Is "Janoska Style" blending the old classical ways with exposure to what the rest of the world has to offer? NL: Some in the classical community are very hesitant to alter a piece in anyway by Bach, Mozart, Beethoven, or any of the other greats. Why is that? JD: I think the most big problem was that nobody has the fear. Everybody is afraid to play something other what is written. How would the audience take it when I play something not written? Of course in jazz music, there we have a lot of improvisation. But in classical music, not really. NL: When reflecting on what you are creating, is the audience for classical music changing? JD: When you are going to a classical concert, you will listen to I don’t know, the Bruch violin concerto, or some Beethoven violin concerto. You will hear always the same notes. The same thing. Only the interpretation is (different). And people in our times, they are really looking forward to have something new in music. Friday's performance starts at 7:30 p.m. at St. Bonaventure University’s Regina A. Quick Center for the Arts. Canalside has already revealed Incubus (August 6) and The Psychedelic Furs & james (July 18) would be coming to downtown Buffalo this summer. Wednesday, Canalside Buffalo announced The Struts and The Glorious Sons will be playing July 25 as part of their summer series.